While it took China a little longer to embrace 3D printing technology, once companies across the country started to get on board, nothing could slow them down. Developments have been made in 3D printing with metal and in aerospace 3D printing, and earlier this month, the first large Chinese commercial passenger jet, featuring 3D printed parts, made its maiden test flight from the Shanghai Pudong International Airport. 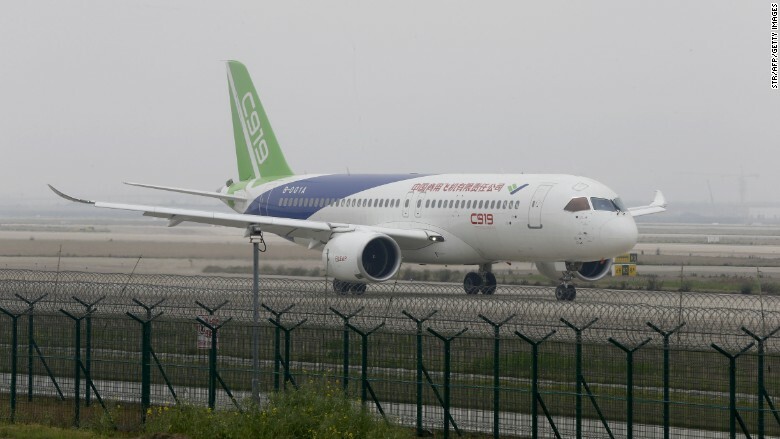 The 168-seat C919 aircraft, manufactured by the Commercial Aircraft Corporation of China Ltd. (COMAC), demonstrated that it was able to safely stop on the runway in case of an emergency in its final ground trial in April, and this month’s successful maiden flight was an important milestone for COMAC, and the Chinese aviation industry as a whole. China hopes to become one of the leading manufacturers of large commercial aircraft, and the C919, which is about the same size as the popular Boeing 737-800 and Airbus A320, is just the first step. It’s been a long journey – the plane was originally supposed to enter service in 2016, as China’s state-owned airlines signed up to purchase the plane back in 2010. But the prototype wasn’t ready until late 2015, due to technical development delays, and it could still face months, or even years, of certification tests, and design changes may be necessary in order to meet safety standards. Additionally, even though China is expected to become the world’s largest commercial aviation market by 2030, beating out the US, COMAC will need to get Chinese airlines to trust it. Other countries, like Canada, the UK, France, Russia, and the US, have been successful in developing large, homegrown airliners, and COMAC will need to demonstrate that its C919 can operate reliably and efficiently on scheduled flights in order to catch up. The C919’s successful first flight, and its development, is certainly keeping in line with the Made in China 2025 master plan, which focuses on ten sectors, including the development of aerospace equipment and 3D printing to boost the country’s overall manufacturing growth. In order to reduce weight and increase safety, COMAC used specialty metals, such as titanium alloys, and 3D printing technology to develop parts for the jet; multiple suppliers across the country manufactured the parts, while COMAC took care of the design and assembly in Shanghai. The current C919 parts were mostly made in China, while foreign suppliers manufactured critical parts: FACC supplied the cockpit and Honeywell Aerospace made the navigation and flight control systems, brakes and wheels, and auxiliary power units, while Liebherr-Aerospace made the landing gear, CFM International provided the jet engines, and FalconTech supplied 30 additional metal 3D printed parts. While these suppliers, and imported 3D printers, were extremely valuable in getting the C919 up in the air, the goal is to increase the local manufacturing of parts to 90%, and install jet engines that are made in China. This “aggressive development” of the country’s aviation industry will definitely increase the demand for metal powders and 3D printers, as China’s metal 3D printer market was 181 units last year, and is expected to grow four times in three years. Orders for the C919 jet are, so far at least, almost entirely from Chinese carriers for domestic flights. I’m certain that will change, but for now, the jet’s maiden flight is showcasing 3D printing technology as a major role model in the country’s manufacturing sector, and the brand effect will help in promoting application and development of other groundbreaking technologies. As more Chinese companies, in the fields of architecture, medicine, and even environmental protection, continue to adopt 3D printing, the Chinese government will allocate more resources to develop the manufacturing sector, to achieve the goals of the Made in China 2025 plan. Discuss in the Chinese Jet forum at 3DPB.com.